The Sindh government has decided to afford “one final chance” to the nearly 13,000 public education staffers demanding regularisation and accrued wages, in the form of an aptitude and eligibility test to be conducted under the National Testing Service (NTS) within a month’s time. Sindh Senior Education Minister Nisar Ahmed Khuhro reiterated the offer – which, a day earlier, had been rejected by the teachers’ action committee and led to a violent confrontation at their sit-in near Bilawal House – at a press briefing at his office on Friday. “The government has firmly decided that all teaching and non-teaching staff for govt-run schools of Sindh would only be recruited after a compulsory NTC-conducted aptitude and eligibility test,” said the minister. HERE has been another, smaller protest going on in Pakistan since the past week, far away from the sound, lights and fulminations in Islamabad. This one has been taking place close to another seat of power — Bilawal House in Karachi. Here the participants include some of those inducted to teachers’ posts by the Sindh government’s previous education minister, Pir Mazharul Haq: they say they have not been paid their salaries for two years and are now being made to sit departmental tests in an effort by the current education minister, Nisar Khuhro, to weed them out. As the African proverb says, when two elephants fight, it’s the grass that gets trampled. In politics especially, when big egos clash, it’s the common man who gets crushed in the middle, his rights and privileges given short shrift. “We are Sindhi Language Teachers or SLTs. Language teachers shouldn’t require National Testing Service, or NTS, certification which tests proficiency in physics, chemistry, biology, mathematics, etc. Some of us are art teachers, too. Why test us for science subjects?” said Niaz Ahmed, a drawing teacher from Mohammad Ali Goth in Korangi. The teacher had his arm in a plaster and head bandaged, too. His shirt was full of blood stains as he stood at the City Court here on Friday after being arrested by police. An English language center has been established with the support of HEC program of “English language teaching reforms project” in Maheran University of engineering and technology, Jamshoro. Voice Chancellor Dr Muhammad Asalm Uqiali said, with this initiative, teachers will be well equipped to learn technical aspects of the English language which has become now mandatory for all of us. This would be helpful for the teachers to access the modern education. The court has released 14 more teachers on bail who were arrested two days ago, in front of Bilawal House Karachi while protesting for the releasing of salaries. All teachers were peacefully protesting when police violently crossed the circle and put them behind the bar, however; 50 teachers were released on bail yesterday by the court. All the appointments were illegal, therefore; there is no space to adjust these appointments. One of the DOEs has also confessed that 200 vacancies were fulfilled illegally on the pressure by the senior bureaucrats. How can these Gilgitis and Bengalis can teach Sindhi subject in the schools? How can these appointments be legalized? Therefore, all these appointments on account of Sindhi teachers will not be accepted. He further said that, Per Mazhar has admitted excessive appointments of teachers have been made. I have never pointed out Per Mazhar for the illegal appointments, but, have talked about the bureaucrats who had been involved into such appointments. Therefore, Per Sb should not get emotional; otherwise, people will get perception that may be there are hidden hands of Per Mazhar in the protest. Minister of education Mr Nisar Khuhro, further, said that we would recruit fresh and competent candidates into the education department, therefore, I have placed condition of NTS test for all the protestors and all those who will pass NTS test will be given jobs. He further told to media that the song of Kala Bag dam is now outdated; although; he endorsed the construction of other dams to be constructed. Former minister education has said that it is not faire to treat inhumanly to teachers who are protesting for their rights. There are more Gilgii and Bengali in the protest in front of the Bilawal House Karachi. He further said that terming all the teachers, as bogus, and deprived them from salaries for two years is against of manifesto of PPP. He clarified if Gilgities and Bengalis have been appointed as Sindhi teachers or any fake appointments have been made they should be rejected but all should not be punished for this. He further said that on the instructions of Mr Asif Ali Zardari, he regularized 7000 employees because PPP has manifesto to give employments to everyone, instead of making them unemployed. It should be remembered that chair will not remain forever, but, it is not democratic to torture these people who are protesting for their rights. 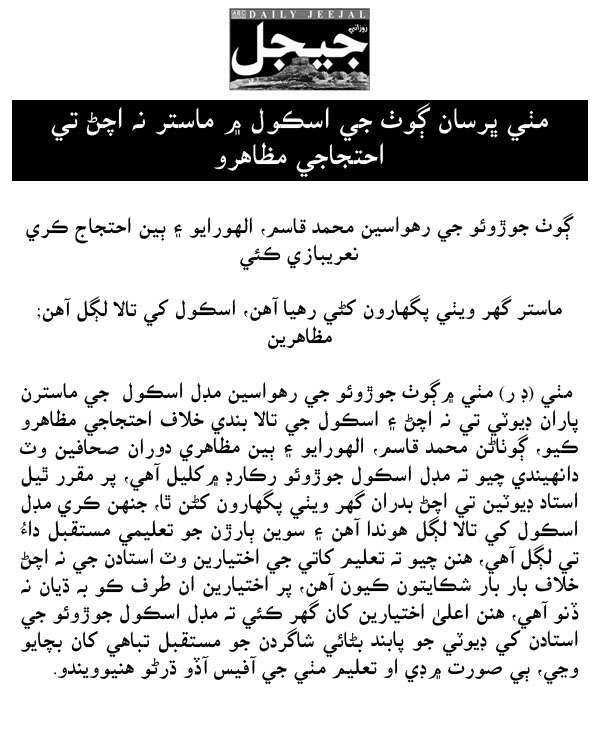 After the merging of Sindhi medium middle school into Urdu medium high school, teachers were transferred forcedly. More than 150 students protest against these transfers. Protestors said students from different villages are coming to study in middle school, but, it has merged into Urdu medium. Sindhi medium school is merged with conspiracy, protestors said. After the transformation of 11 teachers, now, there is no Sindhi teacher in School. Head Mistress, Nasreen blamed that school has been closed by P T Alaf leader, as, he had threatened me that one day he would close this school. P T Alaf leader Mr Muzfar Sansi has used ADO female Rukhasna and clerk Mr Ghulam Qader for his ego only. Representatives of Sindh Adabi Sangat have condemned this act of merger and have appealed to government of Sindh to take notice of it and reinstate the middle school in its actual position. In addition to this, students protested and demanded to bring this middle school to its actual position. District Officer Mr Liaquat Ali Khaskheli, visited Ahmed Shah, Purani Ahmed Pur, Saeed Matelo and many other places where he found many teachers absent. On the spot, he suspended head mistress of Ahmed pur and gave notice to many others. He further talked to media and said that ghost teachers have become the headache for the department who will not be tolerated in future. Those who are taking their salaries must be in schools. A rally was organized by Rural Development Foundation (RDF) with the support of Alif Ailan against the ghost schools in district Jamshoro. Mr Fazul Chandio, representative of RDF while addressing the rally said that 250 schools are closed and 71 are ghost in the district. He further told to media that the 80% schools in the vicinity of Jamshoro are missing the basic facilities. Mr Nisar Brohi, representatives of the Alif Ailaan urged from the Sindh Government to take action against these closed and ghost schools so that the education process could be resumed immediately. Parents protested for increasing fees in school. School administration is increasing their fees illegally, which is not affordable for the poor people. Admission fees have been increased from 300 to 600. Apa Zreena Chana, Zahid Hussain Dayo, Abdul latif Malak, Habib Panhawar, Zulfiqar Chachare and others demanded justice for their children and action to be taken against the head mistress. Members of PPP Shaheed Bhutto, political party, and students protested against the principal. They said Principal Mr Sikandar Gaincho is a corrupt principle and his behavior is not good with the students. They demanded his immediate removal and appointment of the sincere and committed principal. Otherwise, protest will be extended at large scale. Teachers protest against the treasury office Qambar, as the salaries of 430 teachers have been stopped by the treasury office Qambar. Teachers demanded to investigate the corrupt officers and to provide justice to 430 teachers in the district. They warn, If, the higher authority and education minister will not take notice of it then they would extend their protest across the Sindh. A citizen named Kamran khan of Karachi has informed the Sindh home department against the clerk working in ADO office Karachi to alleged him that he has been threatening to put him death. His further alleged that he has been forcing for bribery form every employee and in failing to receive the amount he threats. On the other hand home department has taken notice against the alleged parson and also anti-corruption police has been directed to clear the dust. The school of Thari Meerwah is closed for last twelve years. High school Suleman Aradeen, Thari Meerwah is closed for the last twelve years. Although school is functional in the record of government, but, practically, it had been turned into cattle yard and Otaq of landlord. Parents and students are worried about the issue. They further said that head master is influential person that’s why paying no attention towards it and he had misused funds of school. Even, head master had sold the precious tress of the school. Villagers said, they have complained and have reached to education departments many times, but no one is taking notice of it. They appealed to the government to Sindh to investigate the issue and appoint honest head master to resume the education of students of the area. Villagers protested against the ghost teachers who are not teaching children but drawing their salaries. Villagers of the village Jorao, Taluka Mithi middle school Jorao is non functional and due to absence of teachers school is closed. They warn education department to take notice of it and make this school functional by ensuring the presence of teachers in the school, otherwise, they would plan sit-in in front of district education office Mithi. ADEO Mr Gul Ashiq Memo, along with his supervisor of union council Domani visited 10 schools. He found 4 schools closed, and suspended 6 teachers who were absent in the schools. He further said that ghost teachers will not be tolerated. He advised to teachers to perform their duties with honesty and those who found neglecting his/her duty action will be taken against them. Library was established during Parvez Mushraf Government since then it is locked in Madeji, district Shikarpur . 10 years have passed, but, furniture has not been placed into library, nor have employees been recruited. Students are compelled to go to Larkana for the study purpose. Students said it is very difficult to go to larkana and even unaffordable to go there, but, due to closure of library we go to Larkana to have study there. Students said they have complained many times to authorities and even to Sindh Assembly Speaker Mr Siraj Durani, but, no one has taken notice of it yet. They quoted that India has passed law to establish library at a distance of every one kilo meter, but, unfortunately our established libraries are destroyed. Date for entry Test for Universities is closing down, but, intermediate Board of Hyderabad still did not issue the mark sheets for the passers of current year. Universities including LUMS, Maheran and Sindh Universities have fixed their dates for entry tests in September 2014, but, intermediate board has not yet issued the mark sheets. Students seem worried about their appearance into entry tests into different universities. In this current year, above 11000 thousands have passed the exams of intermediate, from both groups, engineering and medical who had dreamed for joining different universities, but, board’s unnecessary delay had them disappointed. As, Mahran University has fixed date for entry test is 19 September, LUMS 30 September and Sindh University 26 September 2014. During these dates, students seem often busy into attesting documents from the 17th grade officers, but, now they are still looking for the mark sheets to appear into the entry tests. Assistant Controller of board Mr Masror Zai while talking to Sindh Express said that up to tomorrow all the relevant college will send their mark sheets. Whereas, process of printing mark sheets have been started since yesterday. The education minister Mr Nisar Khuhro has admitted 13000 as bogus appointments in education department of Sindh. He said instead of appointing 1425 teachers in Karachi, 13000 teachers have been appointed which are bogus and illegal appointments. He further said, unfortunately, for Sindhi Language 400 Bengal and 200 Gilgiti teachers have been appointed. We admit that two years ago bogus appointments have been made and we would not accept these bogus appointments, therefore, asking teachers to appear in NTS tests and those who will pass the test will be given jobs. He invited Teachers Action Committee to sit gather to resolve the issue through talks, but teachers did not listen to him, he said. While responding to questions regarding the torture upon teachers, he said, education department have nothing to do with torture; as, it is matter of law and order and it is connected with police. After talks failed, teachers were moving towards Bilawal house, therefore, police stopped them and police has performed his job. He further said that they would investigate the illegal appointments and would be scrutinized accordingly. We would try our best to illuminate the unemployment in Sindh. On the contrary, teachers continued their protest for their rights to be accepted. Leaders of teacher association condemned such illegal actions of the Sindh Government against the teachers. Teachers ended their protest in front of the Bilwal House Karachi. Police free 50 teachers on bail. All appointments are legal, just figure is an excessive, former minister education said. There is blame of appointing persons in thousands. Transparent investigation should be carried out. I feel hurt on the news of torturing teachers and stopping their salaries. He further said, due to corruption and inefficiency of bureaucracy of education department some gaps have appeared, otherwise, all these teachers who are protesting are on their right and they should be given their salaries. They had passed NTS test, for which I am the witness. He appealed to the party chairman Mr Bilawal Bhutto to take notice of it, because, there is in manifesto of PPP party to give employment to the people. Those who have made negligence during the appointments should be investigated, but, all should not be punished. Former minister, education appealed to former president Mr Asif Ali Zardari and Mr PPP Chairman Mr Bilawal Bhutto to take notice of the issues of Sindh by own. Teachers said if their appointments were illegal then why they have been engaged into different duties of election and census. They further said, they have regularly doing their duties and teaching children. Since last two years we have not forbidden from our duties but now prevailing education minister is saying our appointments are illegal. District Education Officer Mr Azizullah Odho, Jacobabad admitted illegal appointments and left the charge of district. He further said that fake appointments have been made in the district. Persons from treasury office and DDO level officers are involved into it, he claimed. He said, at least, 7 teachers of fake ID have been appointed in the district and two peons have been promoted as teachers illegally. He further said that he had written letters to district treasury office, but, nothing could happen. He said, an influential person asked him to open old ID was which was also bogus, on his refusal he was threatened. He left to Karachi for sharing this phenomenon to education minister, report revealed. Throughout the district Larkana, more than hundred persons who had given their plots for school buildings on a condition that they would be given jobs in education departments, but, they are still looking for their jobs, even after 20 years. Even though, Larkana high court had ordered education department in 2012 for giving jobs to plot owners, but, court orders could not be implemented. Mr Ali Bux Sethar and Mr Shah Nawaz Bhutto said that education department has been making different excuses. A teacher of private school severely punished a student of fifth class Mr Vinod Kumar for coming 10 minutes late to school. Father of the student reached to school and protested for this inhuman act of teacher. While talking to media, he said my child is studying in private school, he got 10 minutes late to reach to school, and he was inhumanly punished by teacher which is not justice. On other hand, instead of realizing that teacher had done wrong, he has terminated admission of son. 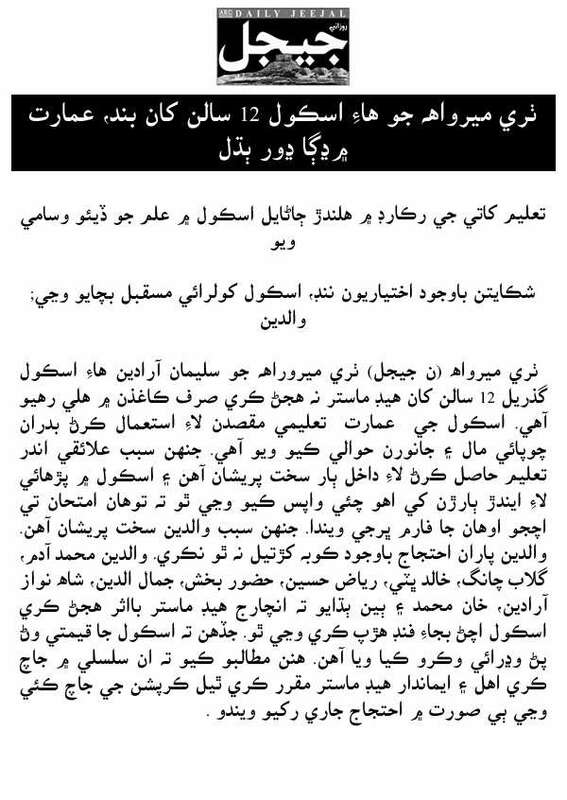 The chairman of Jeay Sindh Qoumi Mahaz (JSQM) Mr Sunan Khan Qureshi has said that education is destroying in Sindh but ruling party is not ready to take practical steps to improve it. While addressing in press conference, along with his party leaders, he said education of Sindh is destroying due lack of interest of the ruling party. In this situation, Sindh Lovers should come forward to play their part for the improvement of education. Leaders of the party said that seminar planned by action committee on September 15, 2014, will be an effective and results oriented. They blamed that ruling party instead of providing free and conducive environment to students they are creating panic and harassment so that students could not voice for their rights. Student wing of national Political party, JSSF protested against the principal of Degree College Qambar. They demanded for his removal from the position, because, student blamed that all the funds of college has been taken away and not single penny has been used for the development of college. Still, college is overwhelmed with multi problems. Protest was led by Mr ZahoorTunyo, Mr Asghar Mugheri, Mr Mir Murtaza Chandio and Mr Ahsan Shah. President of Sindh National Movement (SNM) Mr Mustafa Chandio talking to the media said that it is not justice that those who had come for their rights to get salaries of remaining two years are treated with tortures, punishments and imprisonment. Ruling part that is always claiming for the democracy is now exposed by torturing on peaceful protestors. He condemned this act and said that it is shameful that teachers who are teaching our new generation have been treated in such cruel way. Sindhi medium middle school is merged into Urdu medium high school in Kot Ghulam Mohammad, district Meer Pur Khas. Teachers and students protested for this act of education department and said that now student would be forcefully taught Urdu instead of Sindhi. More than 19 girls’ schools are closed in the area, but, education department has turned blind eyes towards the education of the area. EDO female has maintained criminal silence and teachers are not allowed to protest for this. She said, female teachers are getting salaried without teaching, as, they have been politically supported. Students protested against the closures of schools and ghost teachers in Naserbad, District Qambar Shahdadkot. They blamed, many schools are closed and teachers are getting salaries without teaching children in the schools. In addition to this, shortage of furniture and other things are also the cause of the closure of schools, as, EDO education is getting all the funds personally, but, not utilizing for the betterment of schools and education in the district. They demanded removal of the EDO education. The IBA Sukkur has showed the concerns over the bad education condition in taluka faizganj which is clear apathy of the education department government of Sindh. IBA Sukur disclosed the bad performance of 232 among 495 schools of fifth class of boys and primary schools. 99% of the students are failed in mathematics and in science subject, however; 10 to 15% know about Sindhi subject which is shocking news of r the Sindhi people. Government primary School in village Kechi sundrani has been rented out to local tailors to keep continues their tailoring shop inside the school building. The school was built some 24 years ago in the village since then it has been remained non functional. The local residents held the education department responsible of the closure of school. Villagers said, they approached to the higher authorities, many times, for redressing their grievances, but, none of them has showed any interest yet, however; their children are deprived of their basic right to education. They also blamed that local landlords are also involved into this situation, because, they do not want our children to study. JSSF, student wing of political party Jeay Sindh Tahreek, protested for opening the ghost schools in the area. They blamed that due to lack of interest of education department and corruption of education officers hundreds of schools are closed in Taluka Dokri, District Larkana. Students protested and chanted slogans against the corrupt education officers and said they are the responsible for the destruction of education in the Sindh and Dokri as well. They demanded to immediately open the closed and ghost schools in the area. Teachers are busy into their private businesses, hence, did not find time to visit school. Villager said that education of thousands of students of union councils Ahori, Fazal Bhanbhro, Roshan abad, and Nao Kot is destroying, but, teacher are busy into their private profit. Since last six months, teachers of above mentioned union councils are getting salaries without going to schools. Villagers blamed that due to political back up and involvement of supervisors, educations of our children have reached at alarming situation. They demand to removal of the corrupt supervisors and ensure the availability of teachers in the schools so that the education of the thousands of students could be resumed. Teachers of the district Qambar observed hunger strike with holy Book of Muslims Quran Majeed. Teachers said, treasury office have closed 430 IDs illegally and demanded for the justice. 10 days have passed, but, treasury office Qambar is not releasing our salaries, teachers said. Teachers continued their protest since last 10 days and said protest would be continued till our salaried are released. The AJP central committee members issued press release said that everyone in the Society should play its role for the development and promotion of education in Sindh. They showed their concerns towards increasing corruption in the society and said looters are given protocols in our society. Press release was issued by Ms Nazir Qureshi, Mr Karam Wasan , Ms Saeeda Gopang and Mr Zahida Dahir. The negligence of District officer education Khairpurmirs can be measured from the data collected in Taluka Naro where hardly 70 schools are functional out of total 307. And, 49 girls’ schools which also are closed for last three months. Al mentioned schools, are closed and children are waiting to reopen the school to keep continue their education. SMC funds and other school development funds are misused by the officers. Despite of closure of the schools teachers are enjoying their salaries. Higher authorities do not take notice of it yet. Social activists of tlauka Nara said and demanded that vacant posts of education department should be fulfilled to continue our education. Dr Khalid Mahmood Soomro, General Secretary JUI Sindh had said the Sindh government is responsible for the destruction of education of Sindh. While addressing into his party meeting he said, Madarsah are giving better education then to government schools. Even today, hundreds of schools are closed in Sindh and teachers are getting their salaries without going to schools. JUI can bring the education to its best in one year only if we could be given a ministry of education for one year. Primary school village Gabar Kalhoro, taluka Mero Khan, district Qambar Shahdadkot is closed since last ten years. Teachers are getting salaries without teaching children. Education of children is destroying. Unfortunately school is showed functional on the record and funds of SMC is regularly is received by teachers, but, practically it school is closed since last 10 years. Villagers appealed to government of Sindh to take notice of it and to make school functional so that children of school get education. The Building of government Primary school (One) in paryaloi village is unsafe for students to sit in. In this school roof layers collapsed injured three students during the class. Students were given first aid and then were sent to their homes. Head Master said that he has given application to the concerned higher authorities for repairing the school building, but nothing has been done yet. Students and professors protested for making schools and college relief camps, Shikarpur. They said, like in flood 2010, schools and colleges were made relief for the months, badly disturbed the education of thousands of boys and girls in the district. Professor, Mr Asghar Chano said, in the flood 2010, collage was badly damaged. Furniture was burnt and walls and others things of the college was badly damaged. Therefore, now we protest in front of the higher authorities to arrange some other places for the expected flood, then to make C and S Degree College Shikarpur, as a relief camp. Workers of the different political parties continued their protest against the discussion going on among the authorities for closing down the Ghulam Mohammad Mahar Medical Collage Sukkur. Representatives of the protest said they would never let the medical college be closed. They warn to ruling party to stop hatching conspiracies against the medical college, other scope of the protest would be extended. Education department of Sindh Government has started grant to students of 6 to 10 classes through Telenor and Tameer Microfinance Bank in Sindh. Under the SRP program students of 6 to 10 classes would be given grants. Grant to students has been started into 800 cities of Pakistan and student will be able to get their grants through 50,000 easy pisa shops. EU and World Bank in collaboration with International Development Association is distributing grant among the students. The purpose of the grant is to promote education in the rural areas of Pakistan and Sindh. For starting the SRP program in the Sindh, program was organized in GGDHSS junior model school Karachi on August 29, 2014. Senior minister education, head of micro finance bank Mr Nadeem Hussain and Ms Saba participated in the program where students received grants. Literacy helps to cross an individual from misery to hope and finally to the road of success. It is a tool to improve the standard of living and utilising the potential, said Kiran Zubair, Project Coordinator, Idarae Taleem-o-Aagahi (ITA). The ‘International Literacy Day’ is being celebrated in Drop in Centres, Korangi, recently on the theme “Literacy and Sustainable Development”. In line with the theme for this year’s International Literacy Day, Idarae Taleem-o-Aagahi (ITA) with collaboration with the partner schools celebrated the International Literacy Day in the city, Karachi, under the banner “Provide Education and Safe Schools in Emergencies”. Art, debates and essay competition were held in all primary schools (classes 3, 4 and 5), debates and essay competitions in middle and high schools (classes 6, 7 and 8). ‘Education Walks’ near the local MNA’s offices was placed by school children, teachers and ITA team members in order to highlight the significance of the day and showed solidarity for the issue. The principal of Shaheed Benazir Bhutto Law College (SBBLC) was shot and injured on the outskirts of the city on Saturday. The principal, 55-year-old Riaz Lund, was shot thrice in the chest and abdomen at point-blank range. He was immediately taken to Jinnah Postgraduate Medical Centre in critical condition. However, after performing surgery on Lund, doctors said his condition was stable. Lund’s relatives and colleagues reached the hospital, where Pakistan People’s Party (PPP) leaders and workers were also present, and shouted slogans against the incident and demanded the immediate arrest of the culprits. Denmark has decided to up its engagement with Pakistan and has outlined a US$50 million aid programme for the country. This was disclosed by the Danish ambassador to Pakistan, Jesper Moller Sorensen, while addressing the media at the Karachi Press Club on Friday. The programme’s basic focus would be on primary education and health in Balochistan, Fata, and the rural areas of Pakistan, he said. The ambassador said as for primary education, the programme would target 150,000 students, both boys and girls. It aims at setting up 500 schools, mostly in the countryside. The programme would also be encompassing civil society and gender-based projects. The female students in Panjgur, one of the most literate districts in Balochistan, have recently been attacked by an organization, Tanzeem-ul-Islami Furqan. All the private institutions have been threatened to drop female students. Teachers who have opposed this new group have also been targeted. In addition to this, several institutions have been burnt down. The situation has made it difficult for girls to attend schools and colleges in the district. I request the media to highlight this issue so that the deserving students (girls) are not deprived of their rights. Balochistan Chief Minister Dr Abdul Malik Baloch has said that the inquiry into the “fake” recruitment of thousands of teachers is about to be completed and vowed to take action against officials involved in the wrongdoing. Addressing a meeting of the central committee of the National Party (NP) here on Sunday, he said over 8,000 teachers appointed by previous governments had not joined their duties but were regularly drawing their salaries. He said an inquiry had been initiated and officials found involved in the scam would be dismissed from their service. GTA said that Result of Education Emergency is not positive as on one Hand Government Change the Time Period of Annual Professional Course PTC to two Years. The future of the Prime Minister’s Scholarship Programme for the talented students of Balochistan is at stake as the Ministry of Information Technology has backtracked from its commitment to fund the scheme. The programme for underprivileged students from Balochistan was started in 2011 and the Ministry of Capital Administration and Development Division (CADD), the Ministry of Finance and the Ministry of Information Technology had made commitments to jointly shoulder the scheme. Under the programme, four boys and one girl who pass seventh grade and are between the ages of 12 and 14 are selected on merit from each of the 30 districts of Balochistan. Under the programme, the tuition expenses of the student are borne by the federal government through CADD. Nearly 2.5 million children in the province do not attend school. This was learnt at an enrolment walk organised by the Mohmand Community for Education and Development (MCED). The walk, which started at Peshawar Press Club, was planned in collaboration with Alif Ailaan. Speaking on the occasion, Alif Ailaan’s executive director in Khyber-Pakhtunkhwa (K-P) Munir Orakzai told participants at least 2.5 million children in K-P do not attend school. He said 2,200 schools have been non-functional between 2005 and 2014 because of conflicts and natural disasters. Education is the only development tool which can navigate the province out of its predicament, added Orakzai. After monitoring government schools closely in an attempt to improve the quality of teaching and put an end to staff absenteeism, it seems the Abbottabad District Education Office has finally made some headway. Internal investigation revealed at least 14 teachers had been withdrawing their salary without coming in to work. Some of these teachers have been absent from school for nine years. Official sources said teachers were colluding with clerical staff in order to draw their salary. Some of the teachers, they added, were helped by their political connections. Department officials have worked out a recovery amount of Rs2,094,909. They have already recovered Rs994,706 from seven teachers. Unidentified persons blew up a girls’ school in Nurur village in the limits of Miryan Police Station early Sunday, sources said. The sources said an explosive device planted by unidentified persons in the building of the Government Girls’ Primary School in the Nurur village went off at 3:30am. The government should ensure free transport facility for female teachers to if it wants to improve their attendance at schools and enhance students’ enrollment, said a participant at a certificate distribution ceremony here on Saturday. The National Commission for Human Development (NCHD) had organised the ceremony at the district headquarters complex, Tajazai, to award appreciation certificates to the best male and female teachers. District education officer Nazir Khan, NCHD acting general manager Shaheen Badshah, district programme manager Alaf Gul, SDEO Ikramullah Khan, ADO sports Nisar Mohammad, ADO establishment Shagufta Ameen and other ESED officials were in attendance. ADO establishment Shagufta Ameen said that female teachers faced hardships to reach their respective schools in remote areas in time. Corps Commander Lieutenant General Khalid Rabbani has said that Army Public School and College System (APSACS) is contributing positively in enabling youth to acquire quality education. He expressed these views while awarding certificates to the teachers for their achievements and performances according to a statement issued by ISPR here on Sunday. He said education policies and system have to be constantly monitored upgraded and developed to meet the challenges of an ever changing world. He also appreciated the teachers for their devotion and commitment towards imparting education to the youth. Students of Government Degree College in Jhalka Mela held a protest outside the Hangu Press Club on Saturday against the Kohat Board of Intermediate and Secondary Education (BISE) for registering “fake cases” against their classmates. They said invigilators accused a majority of the college’s intermediate students of using unfair means during board exams and registered cases against them with the Kohat board. According to the protesters, the accusations are baseless. Kifayatullah, one of the protesters, said the staff deputed at the examination centre fabricated fake cases against the college students and the Kohat BISE is doing nothing to address their grievances. Speakers at a literary gathering here on Saturday called for promotion of education and reading habits among young generation, saying that the culture of violence and guns could only be countered through education and not through violence. “Despite advancement of technology, including internet, the importance of books remains intact and time would prove that there is no substitute for books in the society,” said prominent writer and columnist Saadullah Jan Barq. Delivering a lecture on “importance of books in the present age” here at the Research Library, Peshawar, the first private library aimed at inculcating the habit of research in the students, Mr Barq said that development in the west was because of the culture of books and education. Heavy rains and floods have damaged 1,854 public schools across Punjab. The Jhang District is the worst hit district where 280 schools have been damaged by the calamity. Public schools are being used as shelters for the flood affectees. Apart from fully or partially damaged schools, over 1400 schools are closed. For the students of these schools, academic activities are being held either at nearby schools or there are no alternative arrangements at all. The Lahore Board of Intermediate and Secondary Education (BISE) on Friday announced the results of the intermediate annual examinations 2014. Of the 136,433 candidates who appeared in the exam, 79,056 candidates were declared successful with a pass percentage of 57.94. The success rate thus dropped by 3.2% compared to the last year. BISE Chairman Nasrullah Virk announced the results at a prize distribution for position holders at Alhamra Hall 2. Of the five subject groups, pre-medical had the highest overall passing percentage of 84.68 – 87% for girls and 78% for boys. In the pre-engineering group, 75.7% of boys passed and 86% of girls, bringing the group pass percentage to 78.34.In the general science group, the pass percentage was 60.7, the success rate being 71% among girls and 51.6% among boys. Defying the government’s orders, Rawalpindi district’s schoolteachers have decided not to attend their schools on Sunday for the planned anti-dengue campaign. Following the government’s decision of keeping the schools open on Sunday, the representatives of the teachers’ union met on Saturday at Gulshanabad School Rawalpindi, where they unanimously decided that teachers will not attend schools on Sunday. Subsequently, Punjab Teachers’ Union (PTU) Rawalpindi issued a statement saying, “We [teachers] cannot compromise on our weekly off… Sunday means a complete rest day for the teachers and students… so we will not take part in any campaign.” However, sources in the education department told Dawn that the teachers’ boycott cannot disturb Sunday’s programme because most of the schools have already finalised their plans and are in touch with the department. Private educational institutions are playing a pivotal role in providing quality education and government highly appreciates the services of private sector for the enhancement of literacy rate, said Punjab Minister for Excise, Taxation and Finance Mujtaba Shujaur Rehman while addressing inauguration of a private management institute on Saturday. Shuja told that provision of the education is constitutional obligation of the government, but government cannot do this duty single handedly, and requires the support of private sector in this regard. It is encouraging that private schools are providing standardised education and presence of quality school is a healthy sign for the education system of the country. Pakistan is a country where over five million children are out of school. “But in Naya Pakistan, law will be equal for everyone, whether he is a prime minister or a common man,” he said, adding that the PTI would provide education, health, food and easy access to justice. “We will allocate the greatest chunk of budget for education and will spend money on teachers. No government has funded education the way we have done in Khyber-Pakhtunkhwa (K-P),” he claimed. He said his party would implement such a local government system in which every village would have access to their own development funds to run their own schools and have greater power over services sector. “To ensure that police serve all people – and not just the rich and the powerful – a village committee will be formed to oversee workings of local police,” he added. Outlining his future economic policy, he said if voted to power, his government would not seek loans. “In the event of a budget deficit, we will try to cut our expenses to balance the books rather than borrowing money,” he claimed. Students enrolled at 27 academic institutions of Federal Capital which are still closed due to the Constitution Avenue sit-ins will face long-term impacts in the future. A lot of time has been wasted for students, especially those who are due to appear in board and university examinations this year. Expressing concern, teachers and lecturers shared with APP that all post-graduate institutes of Federal Capital are now affiliated with Quaid-e-Azam University, and according to university rules, fifth year and sixth year exams will be held separately, and in these circumstances, it would be difficult to complete the syllabus. For weeks now, large crowds of people have been camped out in the government district of Pakistan's capital Islamabad, protesting against what they say is the corruption of the current government. They are supporters of the cleric Tahir ul-Qadri who, along with the cricketer-turned politician Imran Khan, has been calling for the present prime minister Nawaz Sharif to resign. Mr Sharif won the May 2013 election with an overwhelming majority and says he will not step down. Among the protesters are large numbers of children, some of whom have travelled hundreds of miles with their families to the sit-in in Islamabad. Charities like Unicef have criticised protesters for taking their children out of class. The students enrolled at 27 academic institutions of the capital, not opened yet after the summer vacations due to the sit-ins, would face long-term effects in the future. Already, a lot of time has been wasted of the students, especially for those who would appear in the board and university examinations this year. Expressing the concerns, the teachers and lecturers while talking to the media personnel said that all the postgraduate institutions of the capital are now affiliated with the Quaid-i-Azam University and according to the rules, the university would hold the 5th year and 6th year exams separately and in these circumstances, it would be difficult to complete the syllabus.Likewise, they said that the students of the Federal Board would also be suffering, adding that majority of the topics are interlinked with each other and if they cut short the syllabus and leave a few topics, it would be difficult for the students to understand them in the higher classes. Ministry of CAD has decided to revoke 2 weekly holidays of all schools and colleges functioning under Federal Directorate of Education (FDE). According to sources, Ministry of CAD has decided to make one weekly off instead of 2 in all schools and colleges run under Federal Directorate of Education. Education continues to suffer in Islamabad as many schools are still housing personnel of the Frontier constabulary and police. Angry parents of the school boys arrested on Friday and Saturday for violating ban on pillion riding criticised the administration and termed it equal to teasing peaceful and law abiding citizens. While talking to ‘The News’ outside District Court here on Saturday they said, “We are law abiding citizens and believe in rule of law.” They said the police and magistracy are bent on spoiling lives of our children, who are students of different levels, by arresting them and involving them in criminal charges.” They said that their underage children have been sent to jail for nothing and this act would ruin their future. A large number of Female students, who seek admission in bachelor and master programs, and their parents bemoaned the apathy of Fatima Jinnah Women’s University (FJWU) and National Testing Service (NTS) for their failure to dispatch roll number slips and examination centers for the special Entry Test held on Sunday. Schoolgirl activist Malala Yousufzai’s courageous fightback from being shot by the Taliban has transformed her both into a symbol for human rights and a campaigner in global demand. Few teenagers can say they have been nominated twice for the Nobel Peace Prize, or spent their 17th birthday lobbying Nigeria’s president to do more to free hundreds of girls kidnapped by militants. But Malala is no ordinary teen. She had already been in the public eye for years when a Taliban gunman boarded her school bus on Oct 9, 2012, asked “Who is Malala?”, and shot her in the head. Her father Ziauddin, a school principal and himself a seasoned campaigner for education, helped propel the precociously talented girl from the Swat valley into the limelight. Street-children loitering around in the marketplace in Pakistan are a common sight for the locals. Most survive on the streets through a combination of strategies: they pick trash from large, unhygienic rubbish dumps, sort and sell the waste product to assorted dealers for a pittance. Or, they just beg for money. These children, who are as young as three years old, are amongst the most neglected, exploited, victimised and abused in the Pakistani society. According to the current UNICEF statistics, such children are estimated to be 30 million in Asia, out of which 1.2 million street children are in Pakistan. Institutional failure in Pakistan cannot alone be blamed for this. Our own neglect is to be too. If nurtured, educated and trained properly, these children can be turned into a massive productive force and progressive citizens of Pakistan.